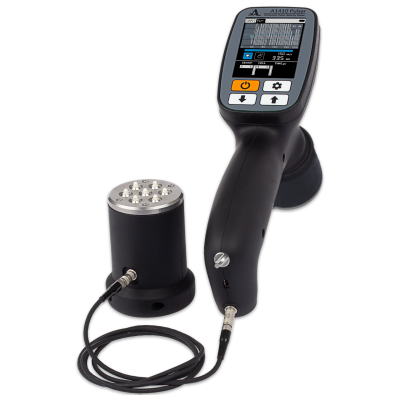 A compact, ergonomic and handheld ultrasonic pulse velocity tester for concrete inspection. The device is made of light-weight shockproof plastic and has two built-in transducers with dry-point-contact with fixed base (150 mm). Wear resistant tips of the transducers are insensitive to the surface condition. Hence, there is no need to apply coupling gel or to prepare the surface for measuring. A compact, ergonomic and handheld ultrasonic pulse velocity tester for quality assessment of concrete. The device is made of light-weight shockproof plastic and has two built-in transducers with dry-point-contact with fixed base (150 mm). Wear resistant tips of the transducers are insensitive to the surface condition. Hence, there is no need to apply coupling gel or to prepare object surface for testing. The device has sound indication when ultrasonic signals are being received, non-volatile memory allowing storing of 50000 measurements (the results can be grouped) and infrared USB port for transferring of the saved data to the external PC. Evaluation of the durability of concrete. The evaluation is based on correlation between time of propagation/velocity of longitudinal ultrasonic waves in concrete. Measurements are performed by the surface scanning with a fixed base. Search for near-surface flaws in the concrete structures by abnormal decreasing of ultrasound velocity or increasing of the propagation time in the flaw area. Evaluation of anisotropy in composite materials. Evaluation of concrete curing during building of poured-in-place concrete method and sliding shuttering. Evaluation of the load-carrying ability of concrete backbones and posts. Evaluation of the depth of the outcrop cracks. Evaluation of porosity and fissuring of the material. Evaluation of the age of material if its physical properties change with time.